"AuntyYoung" is a blog that NaNak started for me 2 years ago. Back then, I only had a little skill in cooking. I was weak in computers, photography, baking and desserts. My first dish. Even though my cooking skills are fine, my decoration and photography skills still have room for improvement. As I tried out more and more new things, I began to grow and learn. As the days passed, I met with the talented, made friends and shared recipes. Slowly, my skills developed and became better. Baking attempts of a year later. My photography and decorative skills have improved alongside baking skills. As time flies, I found a group of friends who gave me advice and suggestions on improvement. They encouraged me to do better. They even reported to me should they notice a copyright violation of my photos! Thank you all! A year and a half later, as my confidence grew, I begin to attempt more challenging things. I feel grateful. This blog has grown, and with it grows my confidence, joy and happiness. During these 2 years, all those who have given me advice, suggestions, directions and kind words, thank you! For all my readers, I will continue to work harder and do better. Despite being 2 years old, this blog continues to see new things. As of today, with the Dragon Boat Festival just around the corner, here is my first ever Kee Zhang. 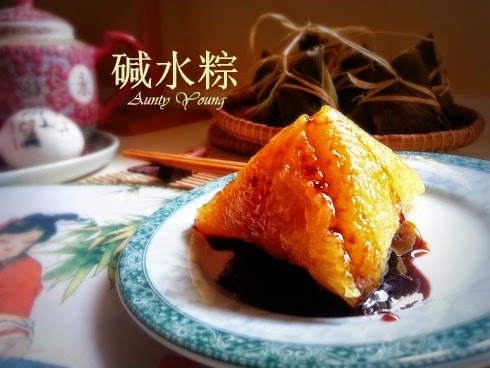 in 2013 I tried the Nyonya Zhang. And now, in 2014, I attempted this Kee Zhang. 12 - 15 bamboo leaves ,softened with boiling water 10 minutes,drained. 12 -15 hemp, softened with boiling water 10 minutes,drained. 1. Cleaned the glutinous rice,soaked for at least 6 hours. 2. Drained the glutinous rice, add in lye and oil,mix well,set aside. 3. 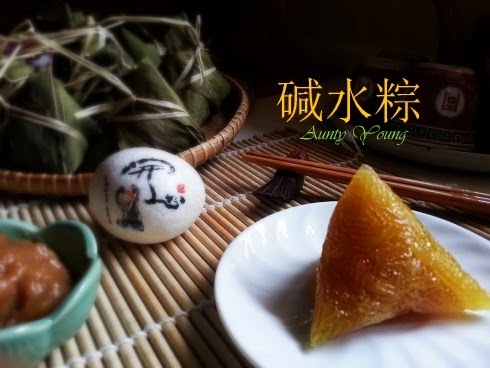 Take one bamboo leaf,fold it into funnel shape,scoop in some glutinous rice,cover up with bamboo leaf and shape like dumpling,finally tight with a hemp. 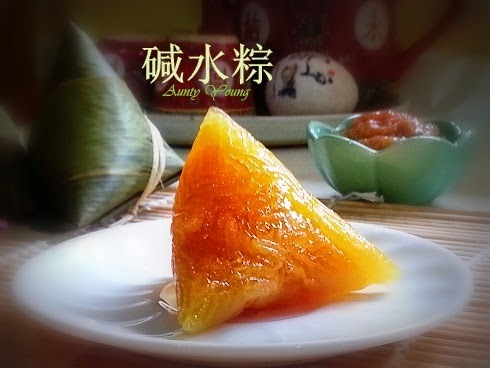 The Kee Zhang tastes mild, but when eaten with kaya or Gula Melaka, it becomes a delicious delicacy. The glutinous Kee Zhang combined with the sweet, aromatic kaya...... mmm! Delicious! To my loyal readers, thank you! Thank you to NaNak and my hubby too, for helping and guiding me. Thank you all! Same thing happened to me, back then I had a hard time how to post to the blog too. Luckyly I have my Little one who is kind enough to teach her very slow learner mummy to overcome the problems. Wa pun ai zuo kiZhang! 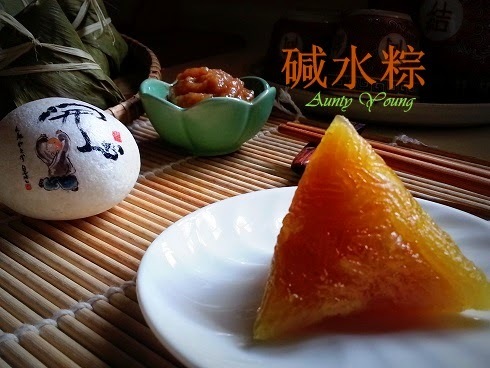 Happy Anniversary:) I too was thinking of making this kee zhang this year. I wondered if I have the time to do it as I still have to do the traditional savory version which my family love more. Thanks for sharing your recipe.will bookmark it in pinterest. So you are going to make both "Kee Chang" and " Bak Chang " ,for your family? Lucky guy they have you as family member. wish you all the best. Happy 2nd Anniversary Aunty Young. Like you I am still learning and I am not good at taking food pictures too. I liked to eat Kee Chang with kaya or Gula Melaka with coconut. This year I can't make dumbling so will savour yours first..
You are always welcome,have it yourself ! 晶莹剔透的碱水粽， 我也想念啦但是没勇气做， 看似不简单...Happy Annivesary 2 u! Good morning Phong Hong, thank you . Yaloh, feel so lousy when look back the initial stage's photo and post, hah....hah...........never mind, we always said "practice made perfect", right? Hi Aunty Young, Happy 2nd Anniversary. 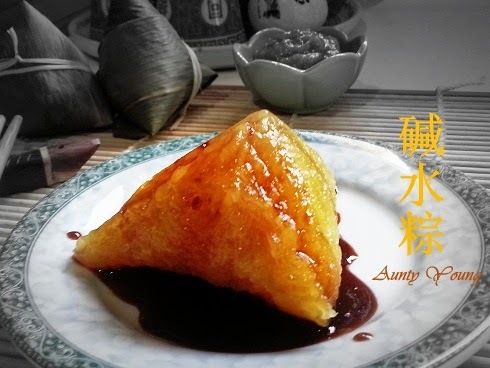 I'm planning to make Kee Chang this year using other recipes apart from my mom's very own family recipe. My family prefers Kiam Bak Chang. I'll do both. Prices of bamboo leaves, chestnuts, salted eggs and pork have gone up this time. I don't know how many I'm going to make this time. Although the prices is increased,but to please our family in that particular day ,we have no choice to make some "chang" too. Looking forward to see your sharing soon. It is my pleasure to have you as a silent reader and here to encourage me for better future. And Happy Belated 2nd Blogaversary ! Looking forward to more from Aunty Young's kitchen.